Did Pat Robertson Claim He Had a Vision of Jesus with an AK-47 in Camo, Signaling the Second Coming? - Truth or Fiction? A popular article appears to report that the televangelist had a startling vision of the Second Coming. 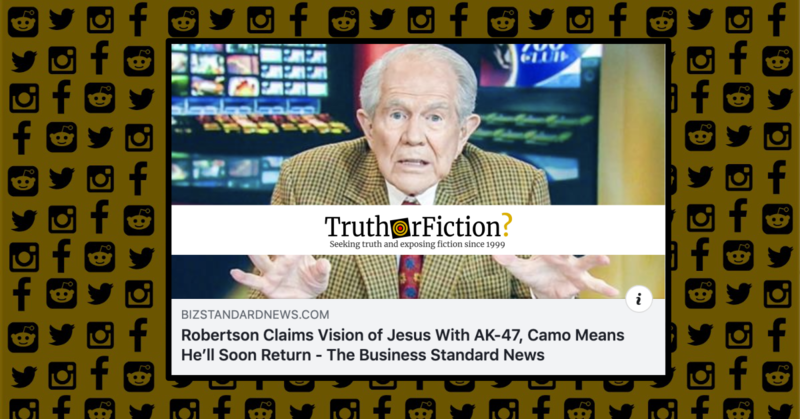 In April 2019, televangelist Pat Robertson claimed he had a vision of the second coming of Jesus, wearing camo and carrying an AK-47. Televangelist Pat Robertson said he had received a message from Jesus Christ telling him that he was pleased with the work of President Donald Trump. Robertson also said Jesus had witnessed Trump’s actions on Israel such as moving the U.S. embassy to Jerusalem and recognizing the Golan Heights as being part of Israel. Israel seized the region from Syria during the 1967 war. Like Robertson, many fundamentalist Christians believe that in order for Jesus to return, Israel must occupy all of its original land. Fundies also believe that about two-thirds of Jews will die during Armageddon. The remaining third will convert to Christianity and recognize Jesus as the Lord.